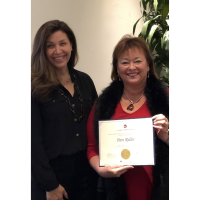 WASHINGTON, D.C. – The U.S. Chamber of Commerce Foundation today announced Pam Ridler, President/CEO of the Castle Rock Chamber of Commerce graduated from its premier business leadership program. The inaugural Business Leads Fellowship Program trained and equipped leaders from state and local chambers of commerce with resources, access to experts, and a network of peers to build their capacity to address the most pressing education and workforce challenges. “Being selected as the only representative from Colorado to participate in the Workforce Fellowship was a wonderful personal opportunity. The number one issue facing our local employers is addressing and finding solutions to the skills gap. I believe the knowledge and relationships gained through the US Chamber’s Fellowship will help us to focus on engaging key stakeholders to champion holistic and scalable workforce solutions through our Talent Pipeline DC program” stated Ridler. Following a competitive application and selection process, Ridler was selected along with 34 other state and local chamber executives to participate in the inaugural class. The four-month program, which ended this week, covered the entire talent pipeline, including workforce development, early childhood education, K-12, and higher education.